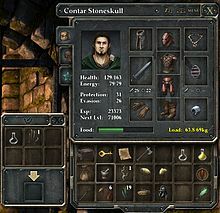 A player character named "Contar Stoneskull" in Legend of Grimrock. The squares contain icons representing items he is wearing and items he is carrying on his adventure. Statistics such as his health and experience are also listed. A player character (also known as PC and playable character) is a fictional character in a role-playing game or video game whose actions are directly controlled by a player of the game rather than the rules of the game. The characters that are not controlled by a player are called non-player characters (NPCs). The actions of non-player characters are typically handled by the game itself in video games, or according to rules followed by a gamemaster refereeing tabletop role-playing games. The player character functions as a fictional, alternate body for the player controlling the character. Video games typically have one player character for each person playing the game. Some games offer a group of player characters for the player to choose from, allowing the player to control one of them at a time. Where more than one player character is available, the characters may have different abilities, strengths, and weaknesses to make the game play style different. A player character may sometimes be based on a real person, especially in sports games that use the names and likenesses of real sports people. Historical people and leaders may sometimes appear as characters too, particularly in strategy or empire building games such as in Sid Meier's Civilization series. Curiously, in the case of Civilization, a player's chosen historical character is the same throughout the course of the game despite the fact that a campaign can last several hundred years before and after the lifetime of the real historical persona.[relevant? – discuss] Such a player character is more properly an avatar as the player character's name and image typically have little bearing on the game itself. Avatars are also commonly seen in casino game simulations. In many video games, and especially first-person shooters, the player character is a "blank slate" without any notable characteristics or even backstory. Pac-Man, Crono, Link and Chell are examples of such characters. These characters are generally silent protagonists. Some games will go even further, never showing or naming the player-character at all. This is somewhat common in first-person videogames, such as in Myst, but is more often done in strategy video games such as Dune 2000 and Emperor: Battle for Dune. In such games, the only real indication that the player has a character (instead of an omnipresent status), is from the cutscenes during which the character is being given a mission briefing or debriefing; the player is usually addressed as "general", "commander", or another military rank. In gaming culture, such a character was called Ageless, Faceless, Gender-Neutral, Culturally Ambiguous Adventure Person, abbreviated as AFGNCAAP; a term that originated in Zork: Grand Inquisitor where it is used satirically to refer to the player. Fighting games typically have a larger number of player characters to choose from, with some basic moves available to all or most characters and some unique moves only available to one or a few characters. Having many different characters to play as and against, all possessing different moves and abilities, is necessary to create a larger gameplay variety in such games. In role playing games such as Dungeons & Dragons or Final Fantasy, a player typically creates or takes on the identity of a character that may have nothing in common with the player. The character is often of a certain (usually fictional) race and class (such as zombie, berserker, rifleman, elf, or cleric), each with strengths and weaknesses. The attributes of the characters (such as magic and fighting ability) are given as numerical values which can be increased as the gamer progresses and gains rank and experience points through accomplishing goals or fighting enemies. A secret or unlockable character is a playable character in a video game available only after completing the game or meeting another requirement. In some video games, characters that are not secret but appear only as non-player characters like bosses or enemies become playable characters after completing certain requirements, or sometimes cheating. ^ Waggoner, Zack (2009). My Avatar, My Self: Identity in Video Role-Playing Games. University of Michigan. p. 8. ISBN 978-0-7864-4109-9. Retrieved 2014-11-12. ^ Douglas, Jeremy (December 2007). Command Lines: Aesthetics and Technique in Interactive Fiction and New Media. ProQuest Information and Learning Company. p. 199. Retrieved 2014-11-12. ^ "Secret Character". TV Tropes. Retrieved 26 December 2018.